Anurognathus was a genus of small rhamphorhynchoid pterosaurs which lived 150 million years ago, in the Upper Jurassic period. It had a short head with pin-like teeth for catching insects. It was found in the Solnhofen limestone, the same place as Archaeopteryx. They grew up to 35 cms wingspan. Although it is in the long-tailed pterosaur group Rhamphorhynchoidea, its tail was comparatively short. This was an adaptation which made it more manoeuvrable in hunting. According to Döderlein the reduced tail of Anurognathus was similar to the pygostyle of modern birds. 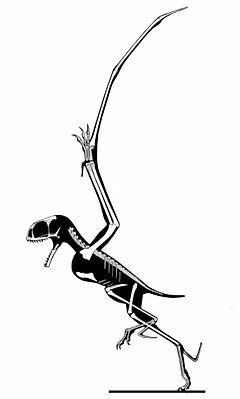 With an estimated wingspan of fifty centimetres (20 inches) and a nine centimetre long body (skull included), its weight was limited: forty grammes for a specimen with a 35 centimetre wingspan. Later a second, smaller, specimen was found, probably of a subadult individual. Its slab and counterslab are separated and both were sold to private collections. This second fossil is more complete and better articulated. It shows impressions of a large part of the flight membrane and under UV-light remains of the muscles of the thigh and arm become visible. It provided new information on many points of the anatomy. The skull was shown to have been very short and broad, wider than long. Anurognathus Facts for Kids. Kiddle Encyclopedia.